I watched this movie a couple of days back. It was reviewed by a pretty cynical critic on rediff that it’s a must watch; so thought to myself why not take a look at it? And I must say, the movie is brilliant - from direction to acting, the background music, a tight script and screenplay of mumbai’s chaos, the movie scores on all points. But first of all, check out the poster- from the pensive look of the hero on one side to the monochrome effect of mumbai’s streets on the other. 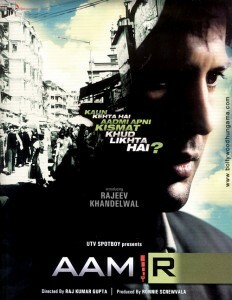 The “i” in the title Aamir is replaced by the network of a cell phone, which plays a major role throughout the movie. Go ahead and watch this movie, it’s better than the rest of the crappy ones that have come out last year. No Comments on "In short, a leader"